OFJCC Specialized Trainer Joe Kelso describes how he trained himself for long distance running with a shift in philosophy. In 2005, I saw a podiatrist for my inflamed Achilles tendon. At the time, I had been running 10ks and half marathons, but my goal was to run full marathons and beyond. The doctor told me my leg and foot structure were not built to handle the repeated stress of long distance running. Since 2007, I have run 34 ultra-marathons ranging from 50k to 100 miles. I didn’t let anyone set my limits. Instead of letting my own failure and the words of my podiatrist hold me back, I focused on building important attributes: durability, resilience and feeling superhuman. The first step was to learn to think like a muscle mechanic. I was able to check and correct my weaker areas to increase my durability and resilience and handle the tolls of running ultra-marathons. With my new methodology, I noticed I was developing compensation patterns that overworked certain muscles while under working and weakening others. I turned to my physical therapy background and researched how to re-align my body. The feet were my first task. My first major discovery was that that my arch was collapsing inward, or overpronating, commonly known as a fallen arch or flat foot. The arch under my big toe would cramp during arch lifting drills, a sign that my arch was very tight and overworked. My number one game changer was suppleness training to soften up and lengthen my grumpy foot. I experienced a light bulb moment when I used a lacrosse ball under my tense arch while watching TV and let it marinate there for a couple minutes. Like pulled pork, my arch was instantly relieved from cramping. After releasing a tense muscle via self-massage, you should then actively stretch or lengthen it for 10-20 seconds. Problems at the feet can have to do with problems at our hips. Massage expert Ida Rolf said it best, “Where you think the pain is, it isn’t.” Muscles, nerves, fascia are all connected and intertwined from head to toe. My Achilles problem was actually a weak glute problem amongst others issues. My new training program kept me motivated to become a muscle mechanic. Most importantly, I decided to stretch after every workout, doing one stretch for one minute. The reward is faster results, less muscle pain and higher pain tolerance during training. And that equals feeling superhuman! “One muscle. One stretch. One minute,” is my bare minimum rule. This practice helps to feel recovered and ready for the next workout. Muscles are always under a state of tension. They like to shorten and stay tensed, like a pit-bull with lockjaw, which is why I also have an obsession with foam rolling before and after workouts. A slow, steady, and methodical system is the best approach towards personal success. Enjoy the process—your only limit is the limit you place on yourself. Joe Kelso is a Specialized Trainer at the OFJCC. He believes that nature intended for us to move and sees his mission to enhance his clients movement practices with simple, concise and passionate instruction. 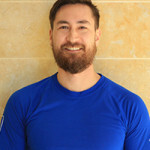 Basketball, football, wrestling, Taekwondo, Ultra Marathon Running, Bikram, power and Vinyasa Flow Yoga have molded his journey to study and teach human movement with an emphasis in sports injury reduction.